There’s nothing quite as rewarding as the first time you make your own nut milk. Then you realise how super easy it is and you’ll never go back to shop bought. Especially as so many have thickeners or sweeteners that aren’t keto friendly. I love it plain and unsweetened but feel free to experiment with other flavours too like cinnamon, adding nut butter or even Keto Nutella, it’s delicious. And it’s the perfect alternative to dairy for those who follow a dairy-free ketogenic diet or even vegan ketogenic diet. Whether you are lactose intolerant or you are avoiding dairy for any other reason, this is the staple keto recipe for you. And it’s the perfect alternative to dairy for those who follow a dairy-free keto diet or even vegan ketogenic diet. 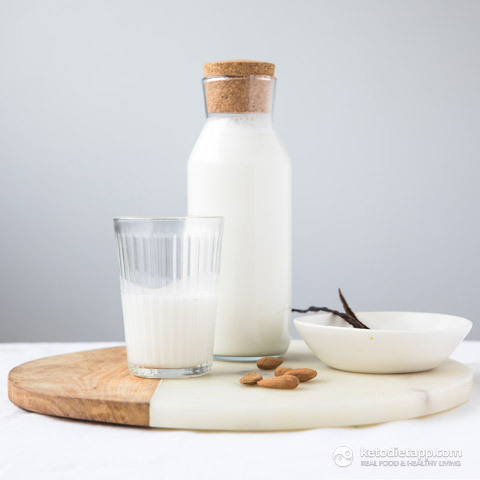 This creamy vegan keto nut milk goes really well with Martina’s Keto Cinnamon Toast Cereal, Anti-Inflammatory Keto Porridge or Low-Carb Chocolate Orange Spiced Granola. You can even use nut milk to make dairy-free ice-creams like this Keto Bounty Ice-Cream. You can also substitute the almonds for any nuts or seeds you like, just make sure you check the soaking guide below for the correct times. Note: Nutrition facts are per 1 cup of almond milk, not including optional ingredients. Values for other types of nut and seed milk will be very similar. 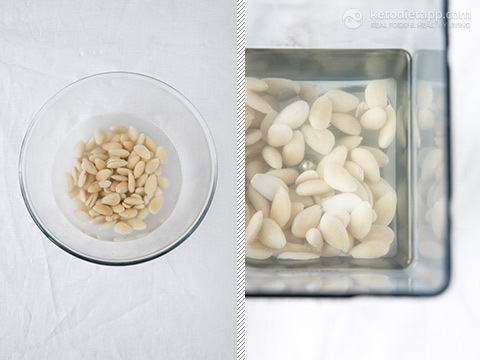 Soak the nuts (or seeds) in filtered water using the minimum soaking times specified above, or leave overnight. When ready, drain the nuts and rinse in cold filtered water. Transfer to a high speed blender, add 4 cups of fresh filtered water and blitz until smooth. 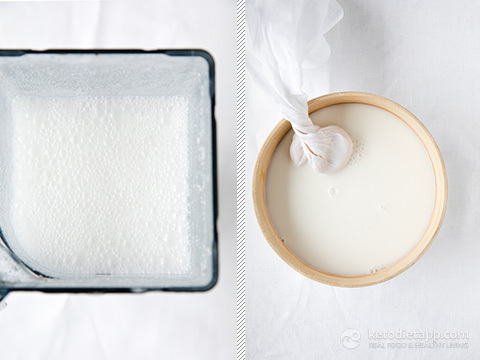 Transfer to a muslin cloth or a nut milk bag and squeeze out the nut milk into a large bowl or jug. Note: you can keep the nut pulp and add to a smoothie or keto cake batter. Transfer the milk back to the blender and blitz salt and vanilla (or any other suggested options). If using turmeric powder, also add a pinch of black pepper (significantly improves absorption of turmeric). Serve fresh or pour into an airtight glass bottle and refrigerate. With fresh nut milk, the water and nut milk may separate in the fridge, just give it a shake before serving and you’re good to go. Store in a fridge in an airtight glass bottle for 2-3 days, or pour into an ice tray and freeze for up to 3 months. 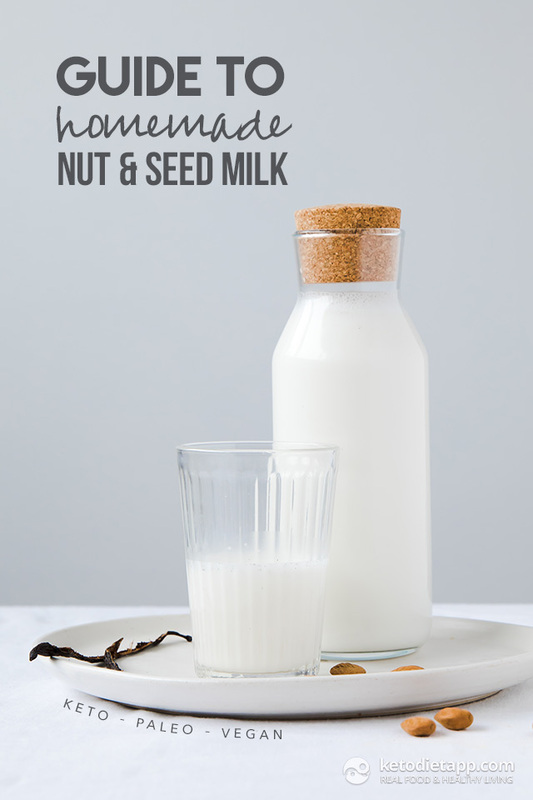 Here&apos;s our infographic on how to make nut & seed milk - click on it to see the large version. Feel free to pin, share and print it! 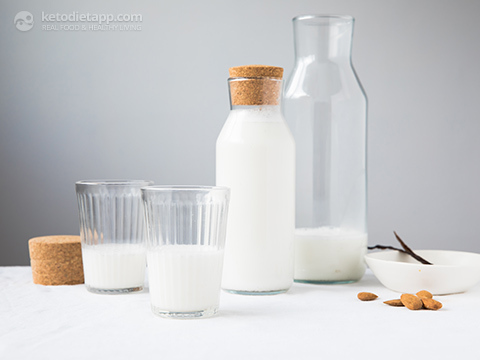 Do you have the nutritional value for all of the different milks? Thanks! Hi Mary, I don't have the nutritional values (I don't think anyone does, at least not exact values, just estimates) but the difference between the nut milks is negligible (very low carbs, protein, fat and calories). You can use nutrition facts for almond milk. Hello! Thanks for your post! I was wondering how much Calcium would be in a serving size of the Almond milk? Thank you Paige! I'm not sure - I only found calcium values for almonds (264 mg per 100 g) and I think most products will have just estimated values. 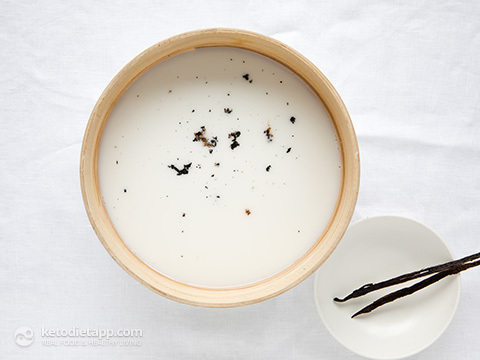 Is there a reason why Soya Milk is rarely referenced within Keto / Low Carb recipes? It’s very low carb so I’m assuming there’s another reason for this. Hi Gillian, soy products are not recommended for health reasons. Products like soy milk and tofu are heavily processed and high in estrogens. The only exception that is recommended is fermented soy products. What I want to know is where to get those milk bottles! They're from Ikea Pudgy, not expensive at all and i agree, so cute. Go grab yourself some. They come in all different sizes too. Thanks for all your support, Jo. Why do you soak all of the nuts first, even macadamias? I have been taking tigernut milk - popularly called “aya” or “Ofio” here in Nigeria. I noticed that you didn’t include it, isn’t it Keto compliant? If it is, is it safe to soak it for a day or two before blending (cos that’s how long I soak it)? pour tout ceux qui te suive . BRAVO encore pour ta générosité et surtout , reste a faire ton blog simplement , tu nous aide beaucoup ...rendu a nos retraite a se défaire ,d' habitude néfaste a nos santé. Thank you very much, for the generosity of your recipes, advice and economy plan, that you offer to all those who work hard, like you, to improve their health ... fragile. 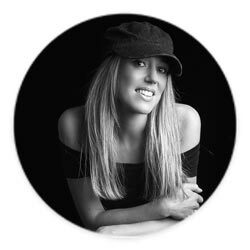 Your blog is filled with good detail, that you worked hard to experiment, for all those who follow you. BRAVO still for your generosity and especially, remains to do your blog simply, you help us a lot ... made our retirement to get rid of, usually harmful to our health. a retreat.